SS (E345) is a 55-yer-old lady. Her problem started around October 2013 when she started to have coughs with a bit of phlegm. There was no blood. She consulted a GP who gave medication but the problem persisted on and off. At last she requested her GP to do an X-ray of her chest. There was “something” in her lung. SS was referred to a hospital in her hometown for a CT scan. CT scan done on 18 October 2013 showed a lobulated mass at the right hilar region. It measures 2.9 x 3.2 cm. 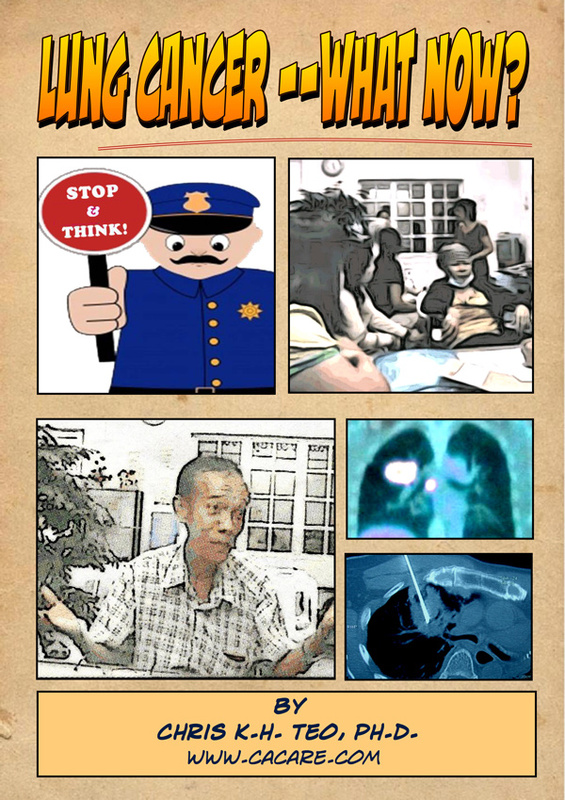 SS was asked to consult a lung expert in a private hospital in Penang. SS did a bronchoscopy. In this procedure the doctor inserts a bronchoscope into the nose or mouth. This allows him to view the inside of the airways and lungs. Unfortunately for SS, the bronchoscope could not penetrate the passageway deep enough and the doctor saw nothing! Fluid taken from the lung during the procedure did not show presence of malignant cells. No intracranial lesion is seen. Few small 5- 7 mildly active hypodense lymph nodes are seen in the right and left side of the neck. A 42 mm metabolic active mass is seen in the middle of the right lung. Multiple smaller 2-7 mm nodules are seen in the rest of the right lung. Few metabolic active lymph nodes measuring 14-26 mm are seen in the right para-trachea, subcarinal and right hilar region of the mediastinum are noted. Based on the PET scan results the doctor was optimistic that surgery would provide good “success.” SS proceed with the surgery as recommended by the doctor. Unfortunately it was an open-close job – failed. The doctor took some tissue samples for biopsy. right pleural node biopsy: no malignancy seen. right lower lobe biopsy: well differentiated adenocarcinoma. right medial lobe: metastatic adenocarcinoma. right paratracheal node: metastatic adenocarcinoma. The tissue is positive for EGFR (meaning oral drugs such Iressa or Tarceva is indicated). SS was referred to the in-house oncologist for further management. The following are excerpts of our conversation. Daughter: The oncologist said it is better to take oral medication than undergoing chemotherapy (infusion). Chemo has more bad side effects. My mother can take either Iressa or Tarceva. Chris: Did you take the drug? a) Are there side effects of the oral drug. His answer: Yes, patients may become itchy and have pimples or sores. b) Can the oral drug cure my mother? His answer: Cannot cure. It is just to control. c) Control for how long? His answer: It all depends on the patients. d) From your experience, how long does the control last? His answer: For some patients the control lasted for one year. After one year, the drug was not effective anymore. But for some other patients the control lasted for 2 years before becoming ineffective. e) After Iressa becomes ineffective, what do we do next? His answer: Go for chemotherapy (injection). D: The cost of Iressa is more than RM 200 per tablet. It comes to about RM 8,000 per month. Why take it when it is not going to be effective? C: After 1 or 2 years on the drug, you will then have to go for chemo. Did you ask if chemo is going to cure your mother? D: No, chemo cannot cure her. Each chemo costs about RM 2,000 per cycle. Later cycles would cost more – RM4,000 to RM5,000. She needs to do 4 to 6 cycles first and then we will see what happen after that. C: When you ask such questions, did you see if the oncologist was happy to answer you? D: He seemed very reluctant and uneasy. Appeared like he had the answer and he did not have the answer. Also appeared like wanting to answer and not wanting to answer. C: How long was your consultation? D: About an hour and his consultation cost RM 100. I have written many books but many people find reading difficult. Some people don’t want to read. Now, I make comic books instead so that you don’t have to read too much. You can finish reading this book within an hour. So go home and read this. Learn from the stories of these people. Be empowered – be smart. Example, if you take Iressa and this cost you RM 8,000 per month. So, for a year, that would come to about RM 90,000. But can it cure you? No! In addition you have to suffer from itchiness, etc. C: Your head – bald? Why? D: She had chemo at the government hospital in January 2014. She completed 4 cycles – each cycle at 3 weeks interval. Patient: Not very bad. I was constipated. My head and some parts of my body became itchy. C: Did you have to pay for the chemo? D: Yes, RM 50 per cycle. They used Gemcitabine (Gemzar) + Cisplatin. After the fourth cycle, the CT scan showed stable result. C: Okay, at least you did it at the GH and did not have to pay so much. If you were to do it at a private hospital, it could cost you anywhere from RM 4,000 to RM5,000 per cycle. (Note: For comparison, a patient from Indonesia has 12 cycles of chemo (same drugs – Gemcitabine + Cisplatin) in a private hospital in Singapore. The total bill came to RM 0.5 million. And the treatment also failed. See: https://cancercaremalaysia.com/2014/04/24/two-billion-rupiah-chemo-and-surgery-failed-oncologist-said-more-chemo-you-just-have-to-trust-me/ ). Do more chemo, and more chemo – until you die? Patient: The tumour did not grow bigger. It did not get small either. D: The doctor said my mother had to take Iressa or Tarceva as a follow up. I again asked how long must my mother need to be on this oral drug. The answer: It all depends on the patient. When Iressa becomes ineffective, she will go for chemo again. So we decided not to take the drug. C: It seems that you are going round and round the same road. D: You do the chemo. Then you take oral medication. Then go for chemo again. Then take oral drug again. C: Did you ask when can you stop the treatment? C: Oh, see how long can you stand the treatment? Then until you die? C: So they are being honest with you. You need to know that there is no cure for lung cancer – even with chemo! 1. There is no cure of lung cancer. The oncologist acknowledged that. 2. But of course, there is treatment (provided you have the money to pay for it, or are willing to endure the side effects). 3. According to the oncologist, take oral drug – Iressa or Tarceva. You will suffer less side effects. 4. Iressa or Tarceva does not cure. It may cost you RM 8,000 per month. And it may be effective for one or 2 years only. 5. When you have reached the dead end with oral drug, go for i/v (injection) chemo which also cannot cure. 6. Then, if you are still alive and still have the money to spend, go for oral drug again. Have plenty of money to splurge? You have an option to go to Singapore — go to the best and the famous. There they may also give the same stuff, chemo with Gemcitabine (Gamzar) + Cisplatin. That seems to be the gold standard. Yet another Indonesia had chemo after chemo and spent about one million Singapore dollars and he died after about 2 years of treatment. I have learned something interesting from this case study. If you wish to try your luck with chemotherapy but do not have the money to splurge, you still have a chance! Go to the (Malaysian) government hospital. This patient (SS) paid only RM 50 for a cycle of chemo with Gemcitabine + Cisplatin. For 4 cycles she only paid RM 200 — compared to half a million ringgit in Singapore! After all they use the same toxic drugs anyway! And the result is just the same, FAILURE – wherever you go! If you want to opt for less hefty medical bills, then go local. Only that you don’t get to become the patient of the best and the famous. The husband of one lung cancer told me he spent about RM 300,000 over 2 years on his wife’s treatment. HIs wife took Iressa and had chemo after chemo. She died just after her husband came to see us. Over the past weeks, many patients wrote and came to CA Care asking for help with their breast cancer. Below is the kind of e-mail we get. My name is W. I am from Indonesia. My mother had a breast cancer on her right breast. She already did a biopsy, and was told that her cancer is grade 3 and the diameter is 3cm. But her body and psychology looks great. Her breast structure still looks good, only a little bit bigger than before. The doctor here recommended that my mother go for a surgery, chemotherapy, and so on. Question: What I want to ask is: Can my family come to your place (CA Care as I know) and get a better solution for my mother’s problem besides undergoing surgery and the chemotherapy stuff? Let me present you the story of LL below. I hope those (like the writer above) who face similar problem can learn from her experience. May this story be your guide and make you think hard about what you can or need to do. Be an empowered patient – decide what you want and don’t be led by the nose. 1. Breast Lump – What to do next? There is a solid irregular hypoechoic lesion in 1 o’oclock left breat, which is palpable. It measures 1.2 x 1.4 cm in size. This is associated with enlarged left axillary node, measuring 1.2 x 2.2 cm in size. There are multiple round well defined cysts in both breasts. In the left breast, the cysts are at 1 o’clock (0.3 cm); 6 o’clock (0.6 cm) and 9 o’clock (0.7cm) and 11 o’clock (0.6 cm). In the right breast, the cysts are at 12 o’clock (0.7 cm), subareolar region 12 o’clock (2.9 cm) 3 o’clock (04. cm), 4 o’clock (0.6 cm) 6 o’clock (2.1 cm) and 8 o’clock (0.5 cm). LL was a bit concerned about the above findings and wanted our advice. She came to our house and we went through the report and images. My Comment: I told LL she had taken the right first step. And I am saying this to all patients who find lumps in their breasts. Go and see a doctor and ask him to do an ultrasound. Find out exactly what the lump is. Don’t be like an ostrich trying to bury your head in the sand. Some patients would want to pretend that there is nothing wrong – a kind of denial! Let me say this: It is dangerous! Don’t play with your life! Based on the images below, I told LL that the irregular shaped lump in her left breast was suspicious. It looks like a malignant lump. There is reason to be concern. The rest of the lumps or cysts in her breasts appear to be benign. 2. To do biopsy or not to do a biopsy? LL was told by her doctor to do a biopsy. If the result confirms malignancy the next step is to undergo a surgery. My Comment: As I have said earlier in this website, you need to remove the malignant lump. There is no two ways about it. Don’t ever hope that by taking juices, herbs or applying certain “magic” potion, the cancerous lump will go away. Over the past 16 years I have seen women who came to us with “rotten” breast – being misled, believing that some of these alternative treatments can make the tumour disappear. That is wishful thinking. Perhaps it some cases people claim that the lump may disappear after their “magic” treatment but that could possibly be a rare exception rather than a general outcome. Breast Lump: Get It Out. 3. Why double surgical intervention? LL went to see a breast specialist. He was rather busy and LL did not get to talk to him much. LL was hurriedly told that after the biopsy she needed to proceed with surgery. Then after the surgery there are many other things more to do. My Comment: I asked LL: Are you happy after meeting that doctor? LL replied: No. But what can I do. He is supposed to be the best in town. My advice to LL and all ladies: If you are not happy with your “potential” caregiver or doctor, go find someone else. Don’t be that helpless, because you have other doctors who can do the same job for you. If the biopsy result shows that the lump is not cancerous, do you still want to keep it inside your breast? Or you still want to remove it? Perhaps for the sake of “peace of mind” you want to get it out too? What if the biopsy result is wrong? That is to say, the result says it is benign but sometime later it turns out to be cancerous? A negative result may not necessary be negative – or to put it differently, if something is not there, it does not mean that it is not there! It is just that you don’t see it or you don’t have a tool sensitive enough to see it. But whatever is there that can be seen, it is most probable that it is there! How else can it not be there (unless it is an artifact or “manufactured”)! LL told me that it does not matter whether the lump is cancerous or not, she wants it out. If that is the case, LL needs to tell her doctor that there is no need for her to undergo surgical intervention twice. Why do a biopsy first. Wait for the result and the come back again to do another surgery. Ask the surgeon to remove the lump with a clear margin and immediately send the tumour for testing. If it is cancerous, the surgeon should just go ahead and remove the lump or breast. This way LL suffers less stress and anxiety. So that is what LL decided to do. The lump in question is 1.2 x 1.4 cm in size. It looks like LL has a choice to either do a lumpectomy (i.e. remove the lump only) or do a mastectomy, i.e., remove the entire breast. LL decided to remove her whole breast. My Comment: From my reading, for a small lump, a lumpectomy is equally effective as a mastectomy. While in theory, it is so – in practice it may not be so. I have often seen patients coming to us after a lumpectomy. Some cancerous tissue was still left behind in the breast! The most common problem is the margin was not clean. This goes to say that not all breast surgeons do a good job. So, LL understood the risk she has to take if she were to go for a lumpectomy. However, I need to stress that patients need to decide for themselves – lumpectomy or mastectomy. However, if the tumour is large (above 3 cm) then a lumpectomy may not be indicated. You have no choice! Not all doctors are the same. Some are good, some are not good. In this, any empowered patient has a choice to who you want to go to. My advice to all patients: Go to someone who shows some concern and empathy towards you. If you don’t like the way he talks to you, or even if for some reason you don’t like “his/her face” – then go find someone else! The reality of today’s medical treatment is all about money. With due respect, if you don’t have money to pay the bills, there is no use talking about choices. You have no choice but to go to the government hospital. There you pay a minimal amount for your cancer treatment, but if you elect to go to a private hospital, you can except to fork out RM 5,000 to RM 20,000 for your initial treatment. But, if you have the money to pay or are covered by medical insurance, then you have a choice. In this case, LL has an insurance cover to a limit of RM 50,000 per year for 10 years! When I first wrote these articles I was shocked to learn that there is such a wide variation in the costs, from doctor to doctor, for doing the same job. An all-in surgery cost can be around RM 15,000 (it is common knowledge that fees and expenses are jacked up if you have insurance cover!). Since we are on this topic of money, I also learned that a 10-minute chat with an oncologist can cost S$700 (RM 1,500) in Singapore; RM 106 to RM 150 in Penang; and RM 250 in Kuala Lumpur. So you have a choice. Some patients are not concerned with the fees, because their insurance will pay for it anyway. But if you have to foot the bill from your own pocket, perhaps you would appreciate my point. The lesson to learn is, no matter who you see, the probable “knowledge” you get from the oncologist is not far from this – You need to go for chemo. The chance of cancer coming back is X percent if you do chemo and radiotherapy and take the hormonal pill. If you don’t do as suggested your life will be at risk. The chance of cancer coming back is high. And if you have the financial resources to consult two or three more experts, the chances are you end up more confused because different experts give you different percentages, views and approaches. Having made the above points to LL, I then suggested that she go and see more surgeons for her problem. She has already consulted with one and was not happy with him. I suggested a few more names. Let me say this right out front. I know of these names from our patients who say they are good. I have never met anyone of them before and I gain nothing for doing this. I do this because I believe I am doing the right thing – to ask you to go to the right doctor of your choice so that you will have more confidence going through this ordeal. So LL went to see Surgeon No: 2. She came back to let me know that he was okay – although a bit too busy to make her feel comfortable. Since she is not entirely happy with this surgeon, then I told LL to go to Surgeon No: 3. He was not a busy man and was not in a rush to show her the door. Unfortunately, he has an uncompromising style. Bear in mind that LL goes to see her doctor with a well defined aim. She does not want to do a biopsy first and then a mastectomy later. This surgeon probably has not much experience dealing with an empowered patient. He got irritated and told her that it is the standard operating procedure and she must follow what he said. Well, he lost a patient that day (perhaps, future referral from me too!). Not happy, LL went to Surgeon No: 4. LL felt good about him. He had the patience to explain what he wanted to do for her. After the lump was removed, LL would be “kept aside” for about 30 minutes while the lump was sent for analysis in the lab. If the result shows malignancy the surgeon would go ahead to remove her whole breast. LL was given a choice to go for the surgery the next day or wait for another “operation day” three days later. I asked LL if she was happy with Surgeon No: 4. She said: Absolutely. Although I told LL not to rush into the surgery, she had decided that she wanted to go ahead with it the next day. After all she was mentally prepared to face the knife. So be it. The total cost of LL’s mastectomy was RM 13,000 and post-surgery expenses came to another RM 5,000. For your information, I have two patients who underwent a mastectomy in a similar grade private hospital. One patient paid RM 3,500 only and other RM 6,000. There were no complications and LL came out of it well, as expected and as planned. But the next battle is about to begin. The histopathology reported a tumour nodule measuring about 20 x 15 x 12 mm. It is an invasive ductal carcinoma, Grade 2. There is probable lympho-vascular involvement. Three out of a total of 18 axillary lymph nodes contained metastatic ductal carcinoma. The tumour is negative for Her-2 but positive for estrogen and progesterone receptors. LL was told this is a Stage 2 cancer. LL told her surgeon that she would not want to do chemotherapy or radiotherapy. The surgeon persuaded her not to abandon the standard medical treatment. He referred LL to an oncologist. I told LL to go ahead and consult the oncologist – after all, his consultation costs only RM 106. I told LL: Don’t close your door – go and listen to what the oncologist has got to offer you. In this way, you would not regret for missing out “something.” And this same message applies to all patients who come and see us. Can chemo, radiotherapy and the hormonal therapy that he is going to give you CURE your cancer? Remember, a cure means the cancer will go away and not recur at anytime in the future? If there no “permanent” cure, then what is the objective of the treatment? What is the success rate of the treatment? What would happen if you do not do the treatment that he suggested? What are the short-term and long-term side effects? How serious would that be? How much will the whole treatment cost? (That is, If money is a concern). LL came back to report what happened. The consultation lasted about 10 minutes (that probably would not be enough time to answer all those questions?). How do you like the meeting with the oncologist? No, LL was not impressed or happy. Her husband said: The talk was about money first. This treatment will cost RM 30,000. In addition LL has to undergo 25 times of radiation treatment at a cost of RM 7,000. After that LL has to take hormonal drug (Fermara or Tamoxifen) for five years. This cost about RM 700 per month. Since LL has a health insurance, they will make sure that all the expenses will be paid by the Insurance Company. LL has to undergo six cycles of chemo with FEC (5-FU + Epirubicin + Cyclophosphamide) – the standard recipe for breast cancer. The only time left for discussion is: What happen if I do all these treatments? With chemotherapy, the chance of cancer NOT coming back is 75 percent, according to the oncologist’s computer. What happen if I do not do all these treatments? The chance of cancer NOT coming back is 30 percent. This means that with all these treatments the oncologist claimed that LL has a benefit of 45 percent. According to LL, the oncologist obtained all these numbers from his computer. He looked at the medical report, keyed in some data and read out the prognosis. I asked: He did not look at you in your eyes and rattle out the numbers based on his very own experience – after treating so many patients? LL felt the same way – he just read out the numbers from the computer! 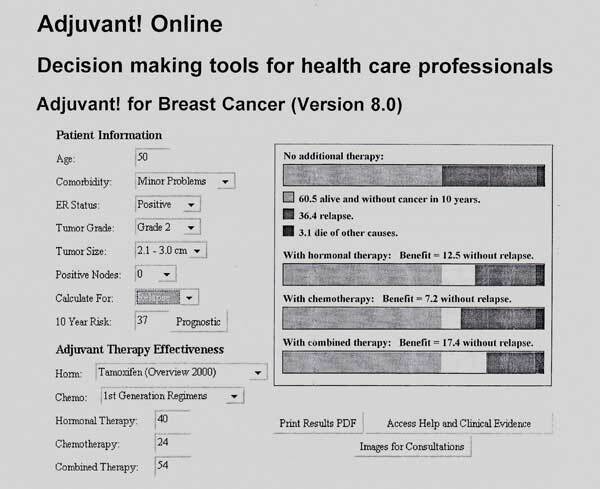 My Comment: I guess the oncologist was using the Adjuvant Online program. But I am a bit puzzled if LL has misunderstood what the oncologist said – benefit of 45 percent. A lady with breast from Singapore also had her prognosis read out from a computer. For a tumour of 2.1 to 3.0 cm in size (which is bigger than LL’s tumour) and ER positive (like LL) the benefit of combined chemo and hormonal therapy is only 17.4 percent! LL told me. No I have already decided that I am NOT going to do all these treatments. I value my quality of life and I don’t want to go through all these and suffer. I want to live a normal life. I fully understand the fear LL has. In this website, I have written many articles under the general heading: Dissecting Chemotherapy. Read them and you know what LL means. In one article, Experiencing the Harmful Side Effects and Collateral Damage, Terry Thompson, a retired US Air Force colonel wrote about his wife’s experience with chemo for her breast cancer. He wrote: Today, I can assure that its devastating effect was eclipsed only by Connie’s death. And, of course, my experience was nothing compared to what she had to deal with. I want to make it very clear here that the decision to undergo and not to undergo chemotherapy MUST BE YOUR DECISION. I am not here to encourage or discourage you from undergoing any medical treatment. I can provide you with honest, alternative views for you to make up your mind. But you must make that vital decision yourself and don’t try to make us your scapegoat should anything go wrong later. Before cancer patients come and see us, we require them to see the doctors first. We require their medical reports to understand what is going on. Almost all patients who come have undergone medical treatments and they could not find their cure. CA Care was their last resort. In spite of that, some patients still want to make CA Care their scapegoat. In this case, LL had made her decision not to go for chemo. I respect her wishes. But to LL and all patients, let me remind you not to close all doors of opportunity. If indeed, in the future, you fail to achieve what you want, you should still go for your chemo. Of course, the mantra is that – It is too late! You should not have wasted your time with those unproven therapy. As explained earlier, the real fact is that, the so-called proven therapy is just as unproven! Most of the patients who come to see us are medically given up cases (unlike LL). Terry Thompson’s wife died after three years – that was after undergoing the proven medical therapy! Patients are often told that with the proven therapy, the chance of cure is 89 percent (click link to read this story), and in LL’s case it is 75 percent. However, a study by oncologists in Australia said the benefit of chemotherapy is only 2.3 percent in Australia and 2.1 percent in the USA. In my article: Please Tell Patients the Real Truth, I quoted Dr. Morton Walker: I was astounded at how distorted the physicians’ presentations were when they discussed the side effects of their treatments. The doctors appeared to become almost like used-car salesmen in a pitch for their surgery, radiation therapy and/or chemotherapy. I know something about medical practices and oncology from my work as a medical researcher and as a former practicing podiatrist. In my opinion, the information the oncologists gave my fiancee was hardly an honest assessment of the relative benefits and risks associated with the recommended treatments. If LL wants to travel this alternative road for her breast cancer, she must understand the following points. 1. Not all breast cancer are the same, and not all patients respond to the same treatments in the same way. 2. Statistics is about a group of people, and it does not necessarily apply to you. 3. There is NO right or wrong choice. 4. Patients should give full respect to their doctors. Listen to what they have to say or offer. Evaluate what they say and then make up your own mind. Patients should not be arrogant when expressing their requests or questions. Remember, you are not “at war” with the doctors – you are “at war” with your cancer! However, patient-oriented care, also calls for doctors to give due respect to their patients. Caregivers should be sensitive to patients’ need, wishes and beliefs. In short, respect must work both ways. 5. This is your journey. It is only you and you alone who have to choose your path. Others can only empathize and help you. So with all the information you gather from different sources, make your decision wisely. Do what you think is right for you.